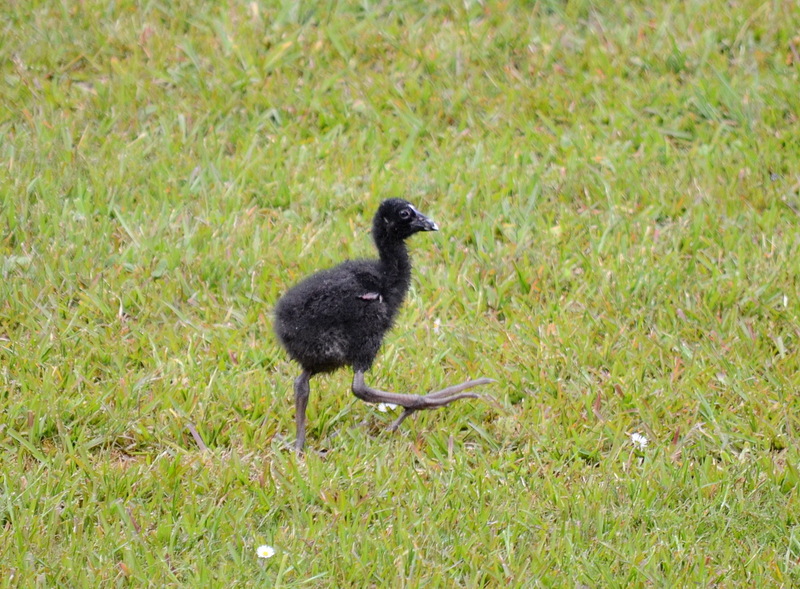 After leaving Muriwai and the Gannet colony, Bob and I planned to make a stop at Ark in the Park en route back to our lodgings. 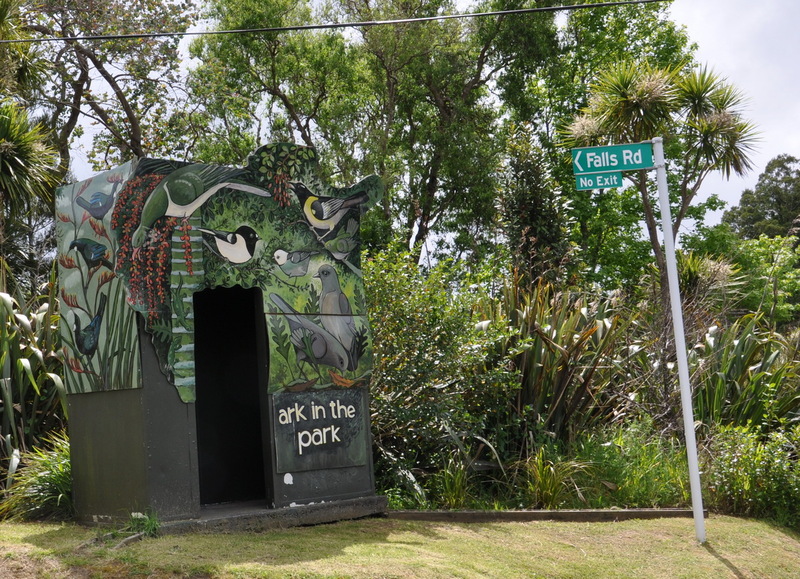 Ark in the Park is a conservation area of note in the Waitakere Ranges Regional Park of Auckland. 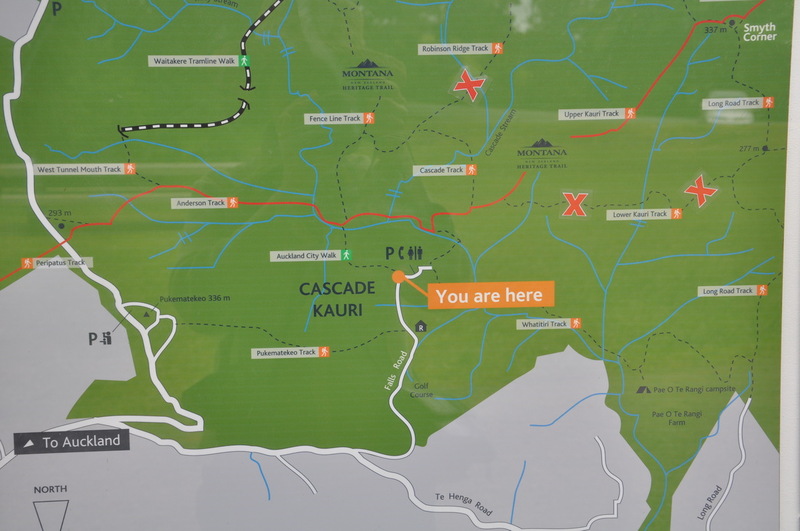 Situated in Cascade Kauri Park, it is where concerted efforts are being made to restore the ecology of the area to its natural state. At the entrance, there is a control gate, at which we had to adhere to strict rules requiring visitors to clean their boots before embarking on the trails. 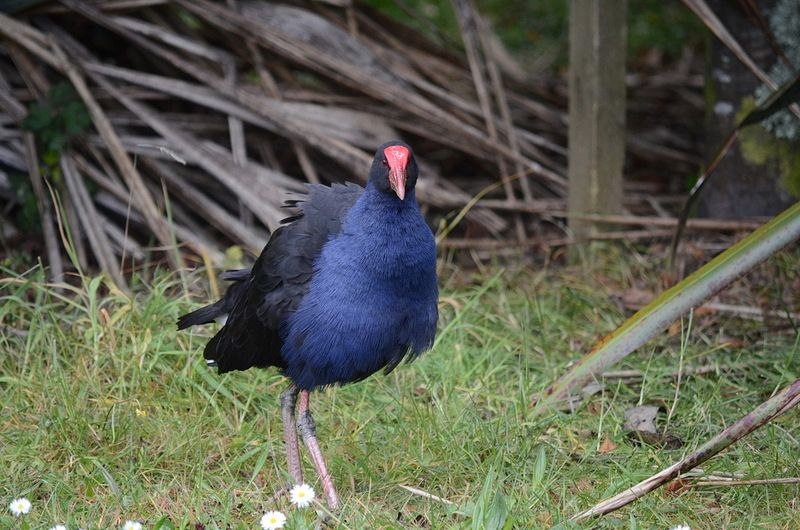 This is an exercise in due diligence to prevent introduction of viruses that destroy native trees such as the Kauri Trees. 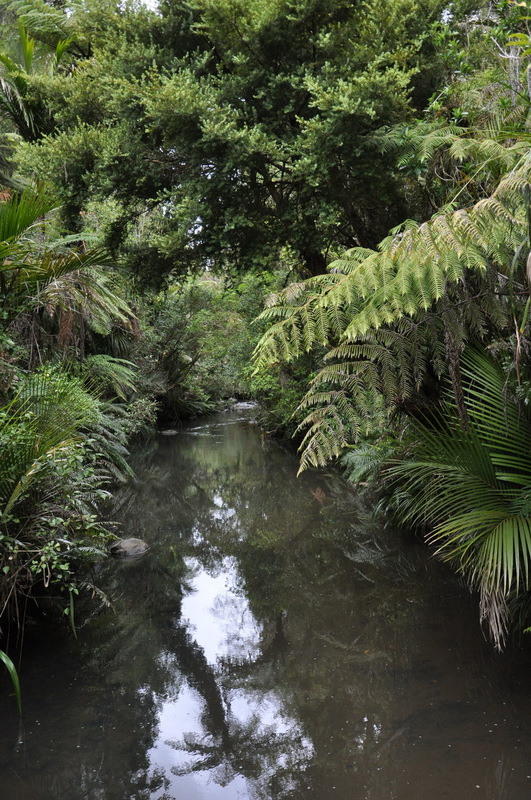 We determined from the trail map that we would follow the Auckland City Trek since it follows a stream, and any hike near water appeals to me. 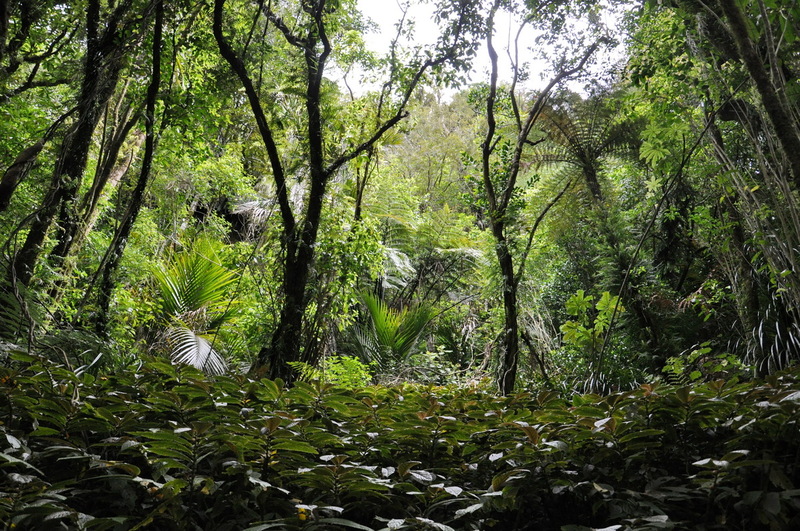 The afternoon tended to be overcast by times, and the thick forest canopy deepened the shadows making the jungle even more mysterious. 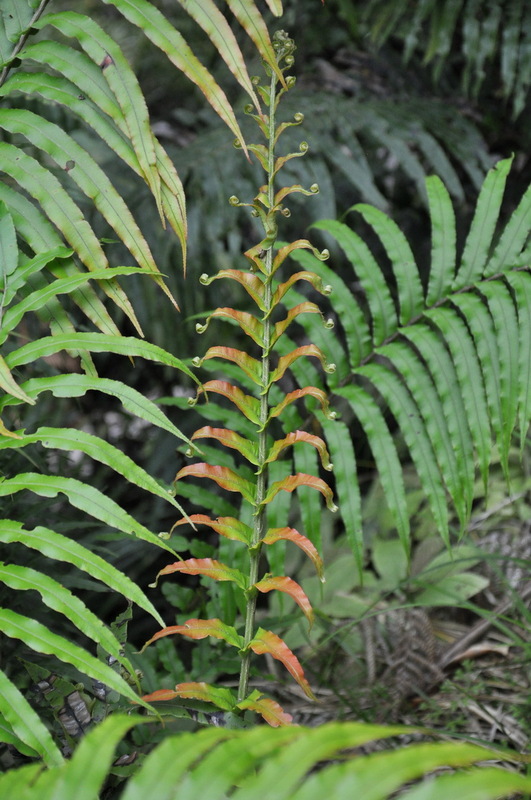 I was in awe of the variety of plants forming the dense undergrowth and the myriad shades of green that had everything melding into one impenetrable wall of vegetation along the trail. 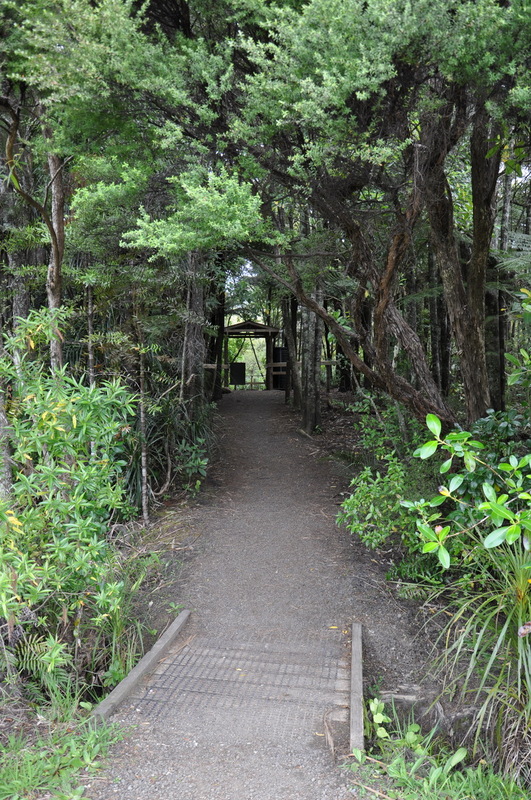 It was like a breath of fresh air when the forest opened up to a clearing where one Kauri Tree towered over us. 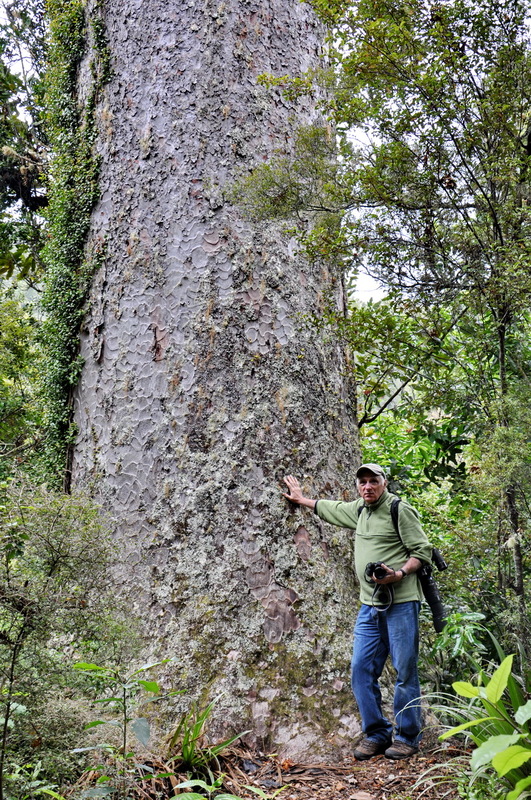 Kauri Trees are coniferous trees that are among the mightiest trees in the world. 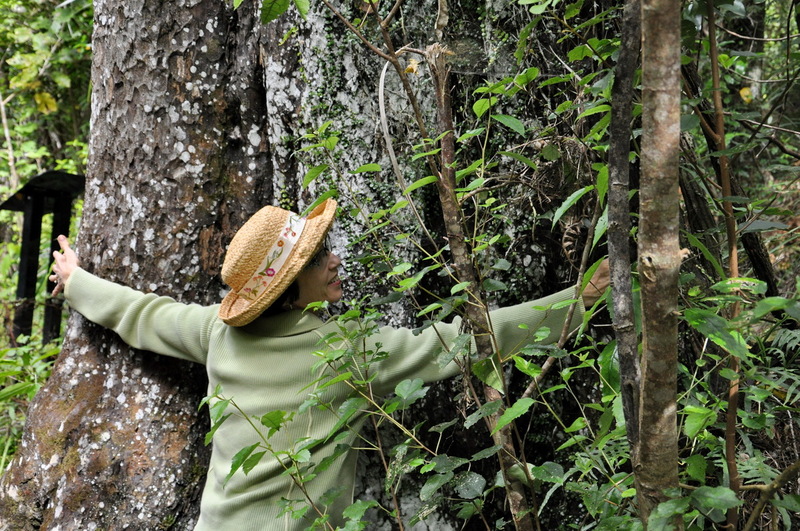 These trees can achieve a girth of 16 metres and can live up to 2,000 years. Bob and I went deeper into the jungle. 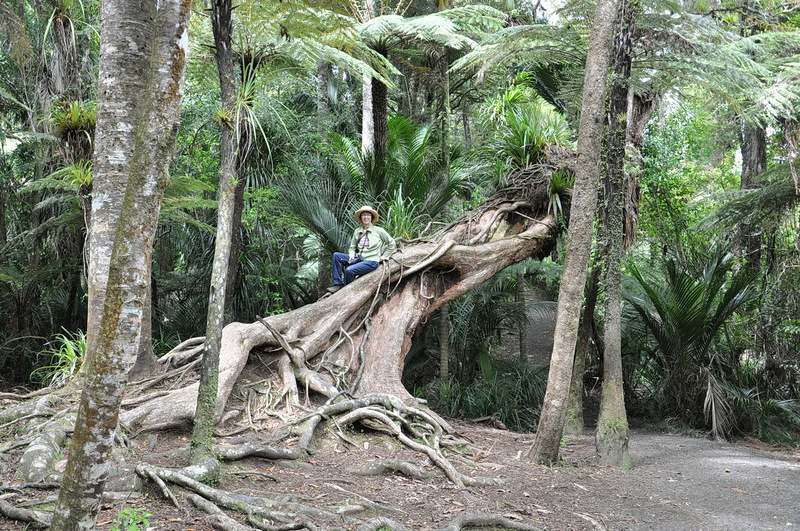 Always a child at heart, I clambered up the smooth trunk of a fallen tree that lay to one side of the footpath. 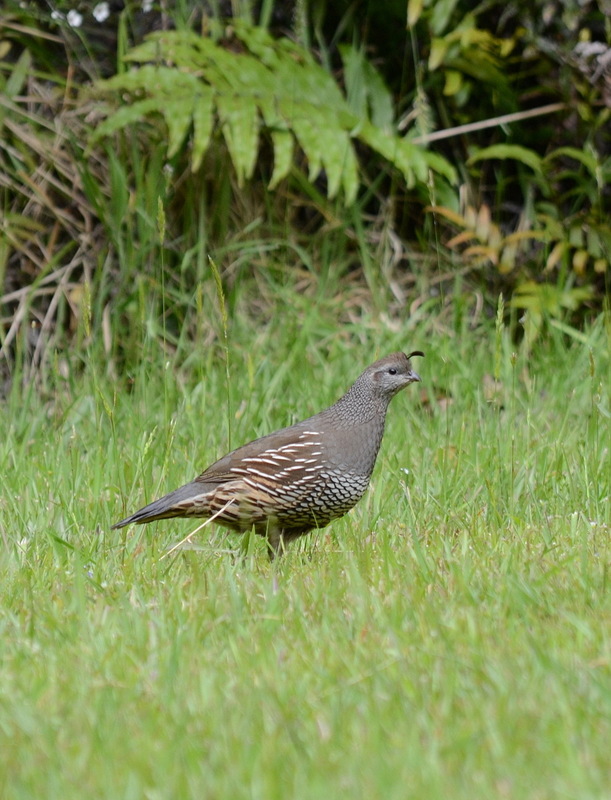 One thing that we were grateful for is the absence of snakes in New Zealand, so we never had to worry about inadvertently crossing paths with one. 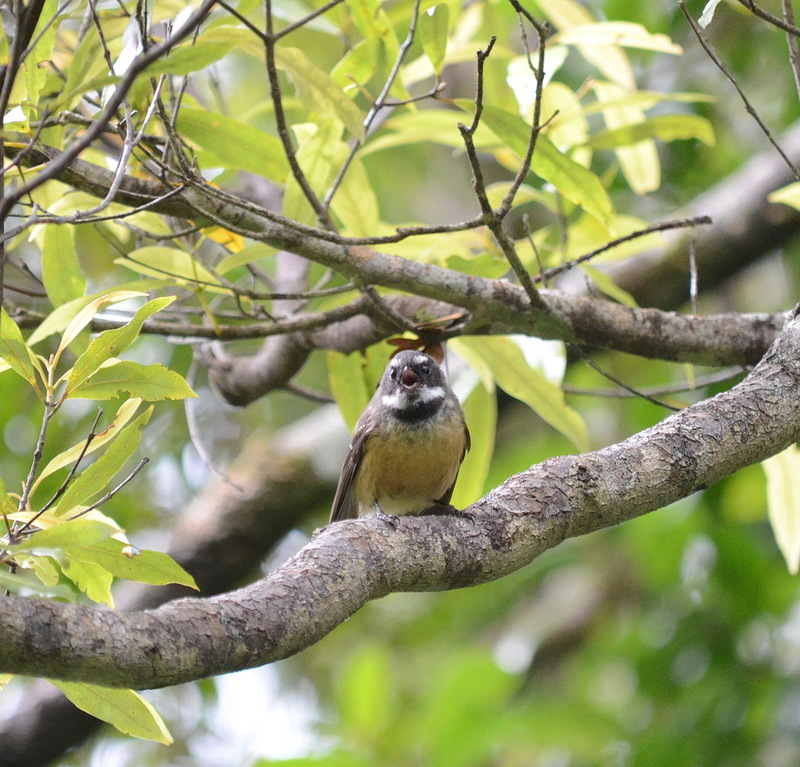 Being avid birders, we thrilled to the song of a new bird, a New Zealand Fantail that flitted among the branches above our heads. 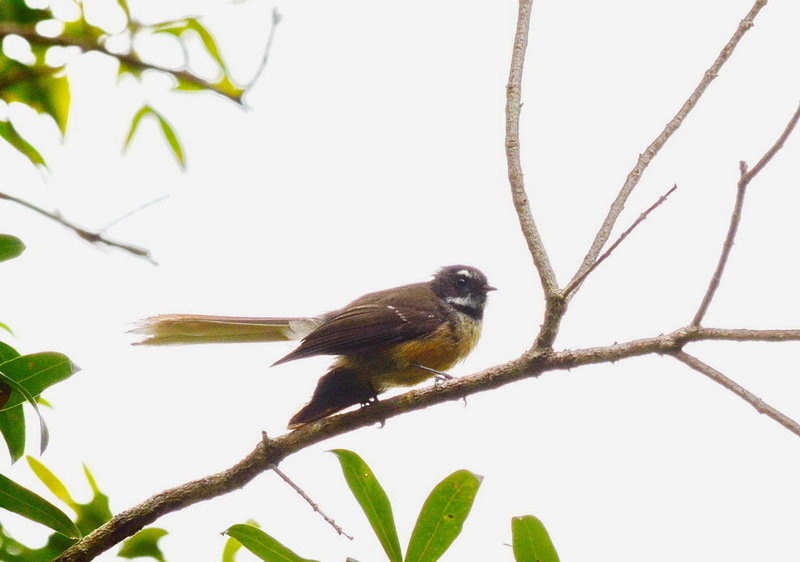 Shooting into the sun produced this photo that adeptly illustrates the length of the Fantail’s tail, which, when flared, would definitely resemble a lady’s fan. and the tree hugger in me meant that this giant White Pine couldn’t escape an embrace intended to show the immensity of its girth. 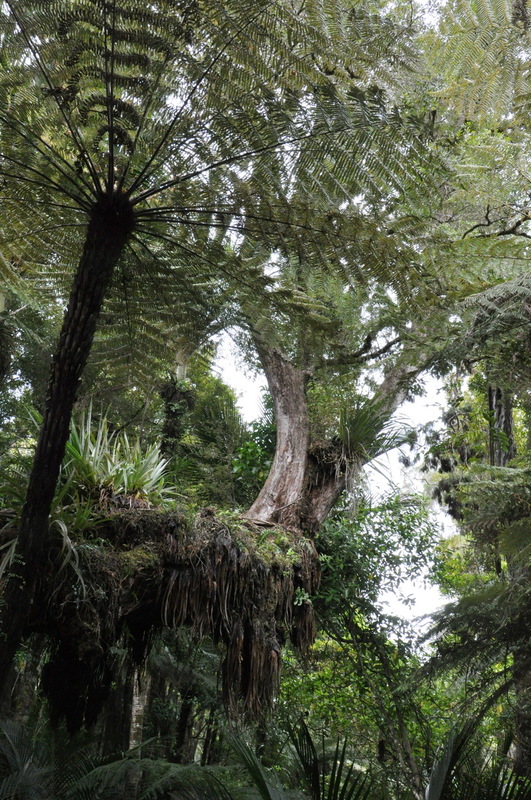 A White Pine’s preference for growing in deep hollows means that it has to reach extremely high to get to the sun making these trees the tallest in New Zealand. 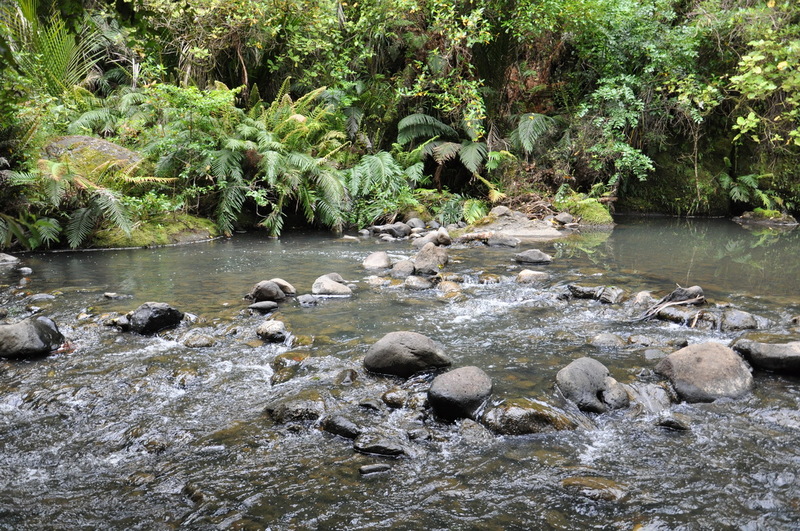 Where the stream passed by, the jungle vegetation found pockets of sunshine, and in reaching for the warmth of the sun’s rays liberally draped over the cool, flowing water. 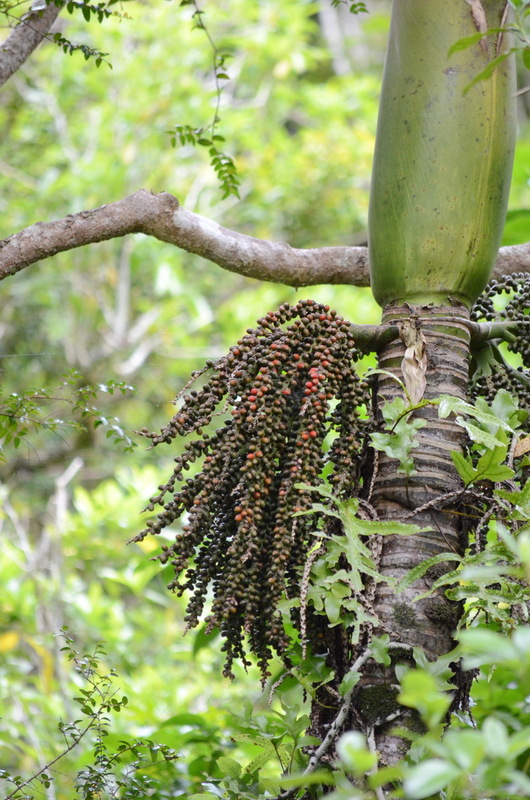 Of particular interest to Bob and me were some of the tall palm trees that were weighed down with fruit. 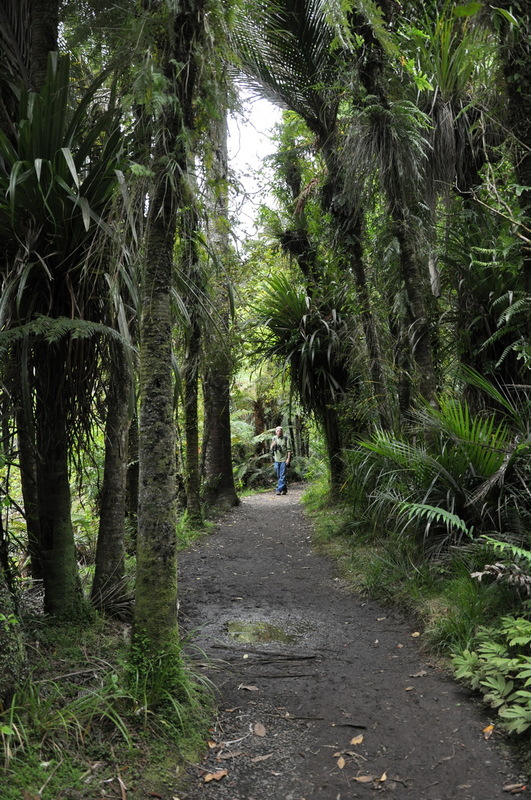 These Nikau Palm Trees, we learned, are endemic to New Zealand and the only species of palm native to that country. 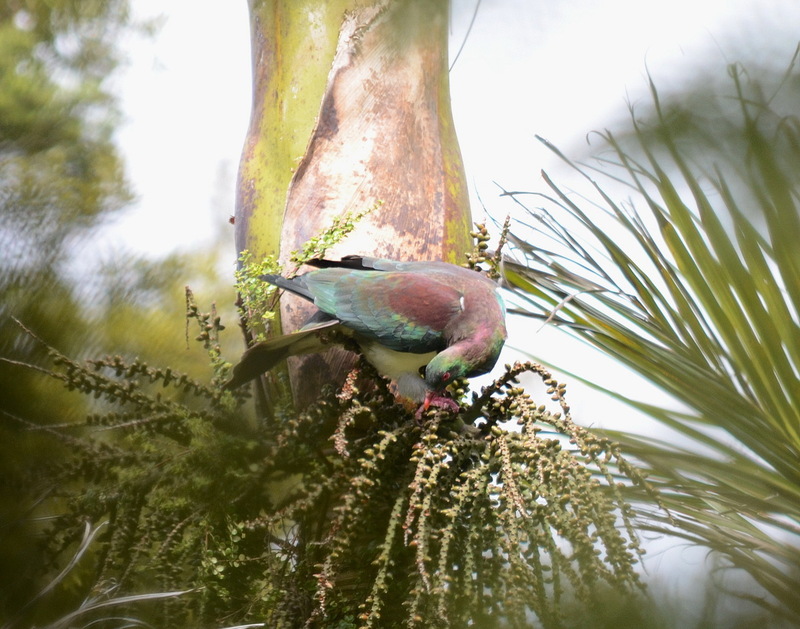 It made sense then to see a New Zealand Pigeon ingesting some of the Nikau fruit, one of its preferred foods. 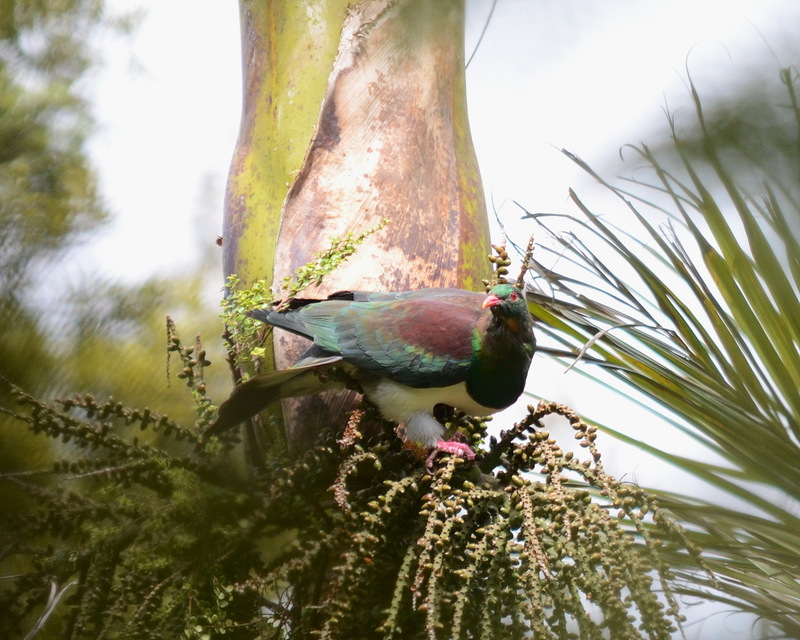 Also called a Kereru, the New Zealand Pigeon is endemic to New Zealand. 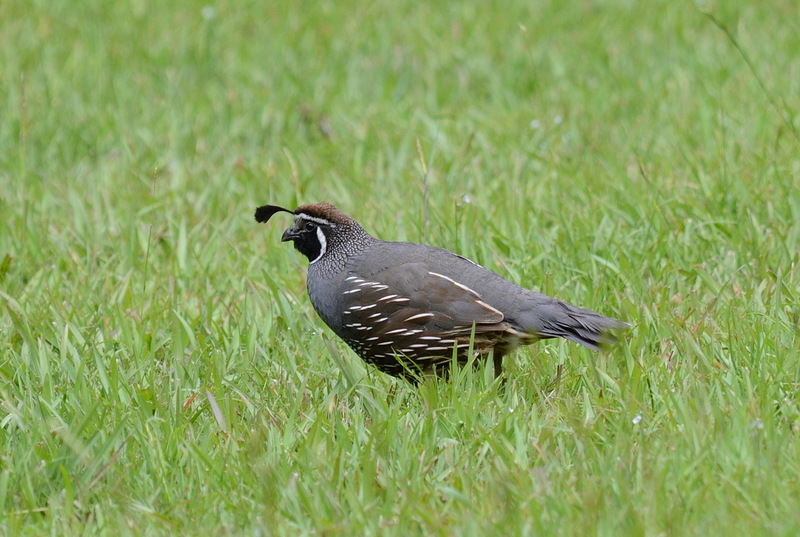 It would be hard to miss one of these birds when perched in a tree because they are very large and colourful. 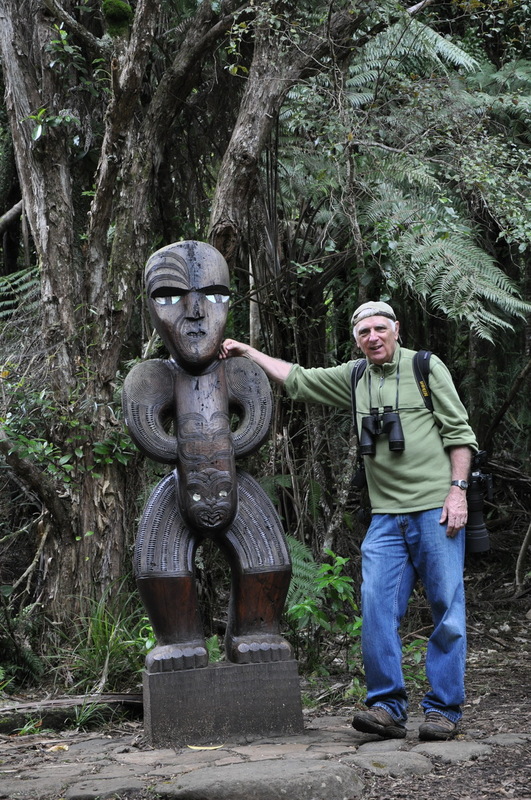 At one fork in the footpath, it seemed fitting to come upon a piece of art, a sculpture representing Manu Whenua. 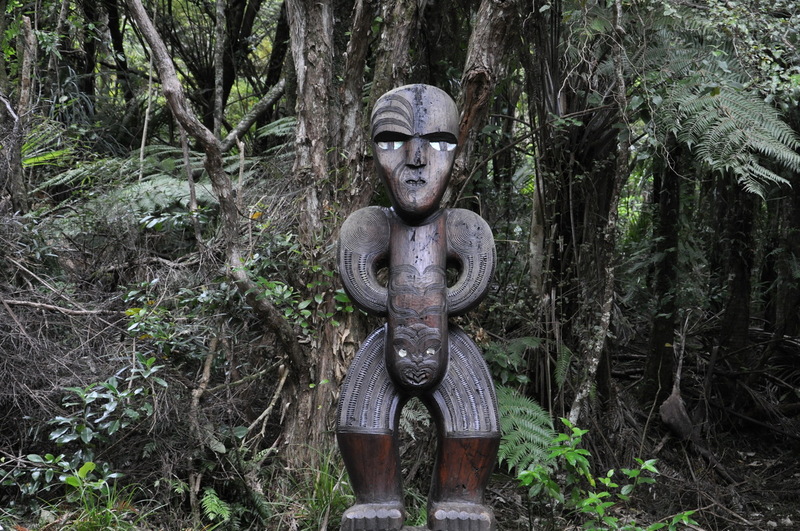 The beautifully sculpted statue embodies the meaning of Manu Whenua, which refers to the power that comes from the land and the territorial rights of the Maori people. Manu Whenua speaks to the importance of that relationship. 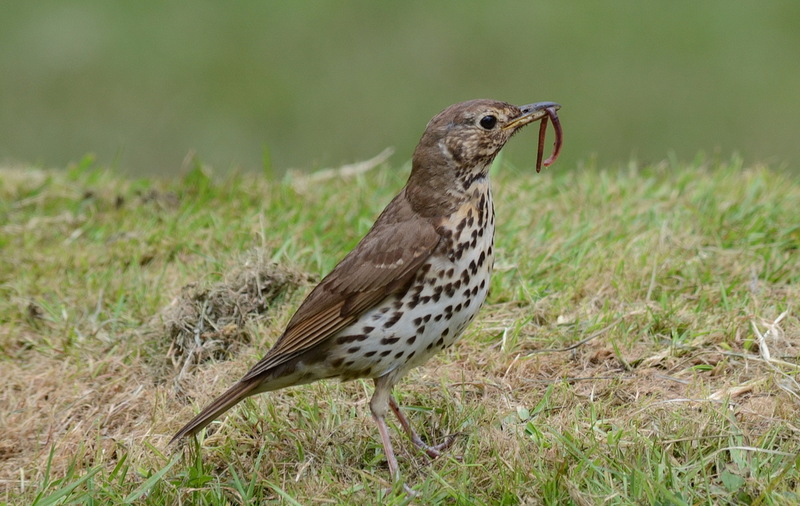 A Song Thrush pulled one worm after another from the damp turf. 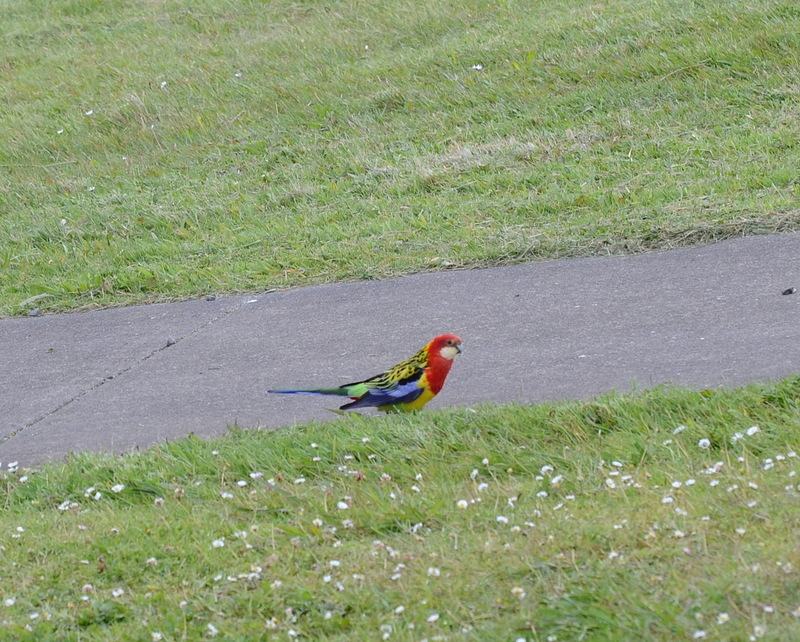 And perhaps giving us the greatest thrill was a pair of Eastern Rosella, birds that were totally unexpected. Who wouldn’t be enchanted with the stunning display of plumage when one of these parakeets takes flight? 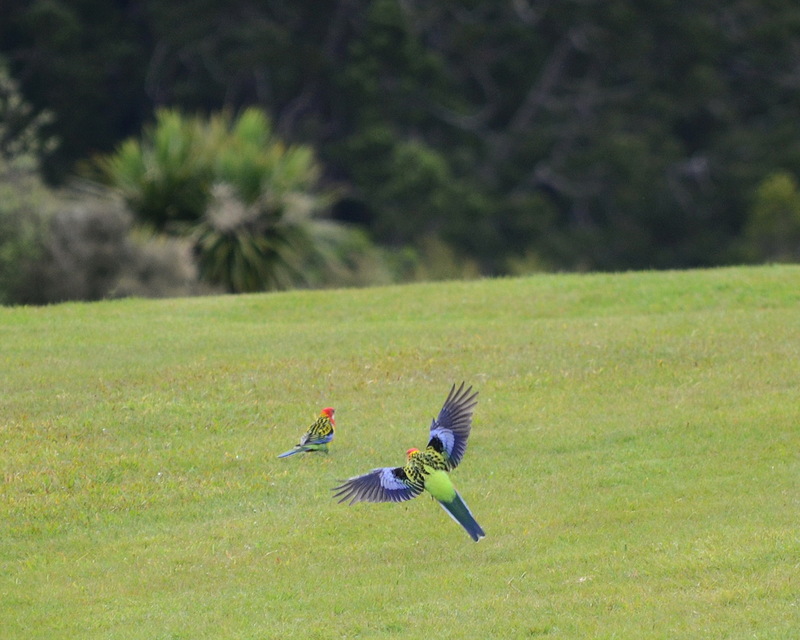 Members of a feral colony, Eastern Rosellas were introduced to New Zealand from Australia in the early 1900s and are now common over much of New Zealand’s North Island. 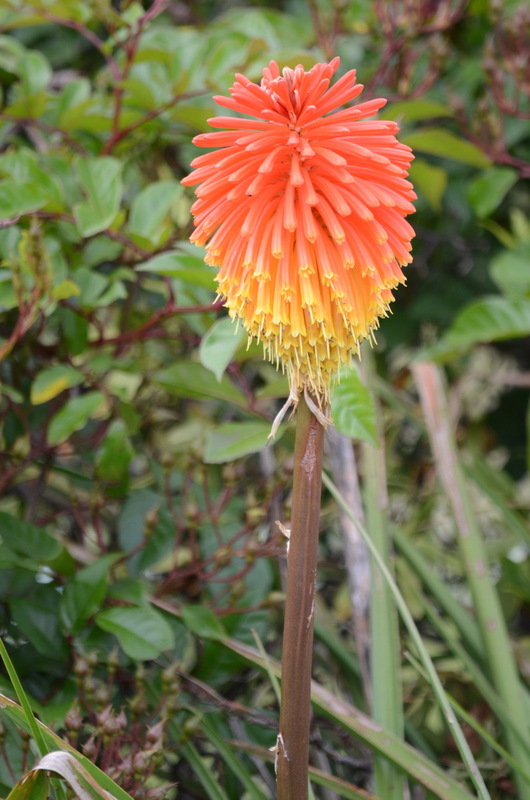 As if lighting the way back to our vehicle, a small group of Poker Plants stood tall and bright in a small nook at the edge of the forest. 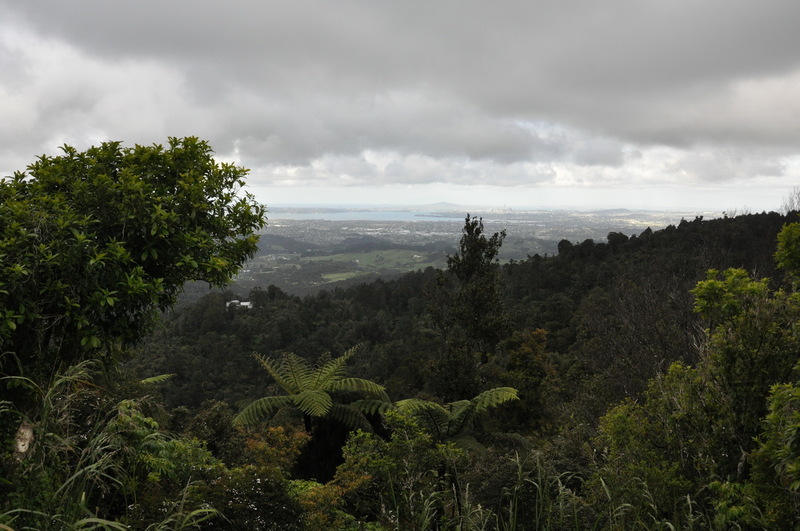 As we retraced our route back to our lodgings in Karekare, we enjoyed this lofty view of Auckland. A brief stop to snap this photo had us reveling in the sweet air perfumed by myriad wildflowers that formed hedgerows along the road. It was a heavenly way to end the day.